There is no denying the fact that birders are a discriminating bunch. This seems to apply especially to birders in North American since most European birders couldn’t discriminate between a Marsh and a Reed Warbler to save their life, but even here in the good old Europe, our hearts are impure – mine included. Of course I am aware that all birds are created equal, but I’ll be honest: I just can’t get overly excited about terns. I’m somehow okay with Chlidonias terns, but Sternas and the likes just don’t float my boat. Or Sylvia warblers? Not really my thing either, even though they are the most colourful warblers we have here in Europe (whatever that means). 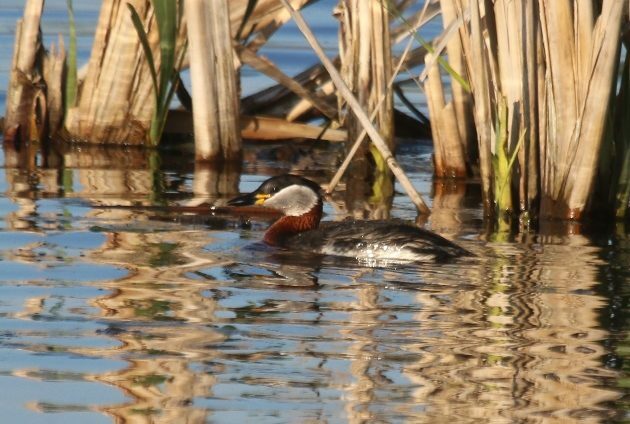 Grebes, on the other hand, are a group of species I consider to be more equal than many other equals, and in a European context, I am rather fond of the wonderful Red-necked Grebe. But first some context. Europe has five regular grebe species, and all of them can be found as breeding birds in Germany. 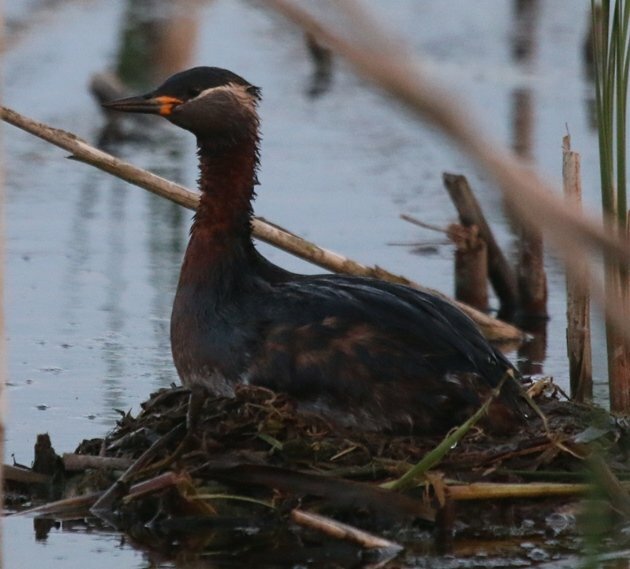 Great Crested and Little Grebes are widespread throughout and easily found year-round. This is good news to visiting birders from North America since these two are the only species we don’t share with the New World. The other three however are much more localized or seasonal and require more effort, a want for long drives, and it won’t hurt to have some knowledge on where to find them either. 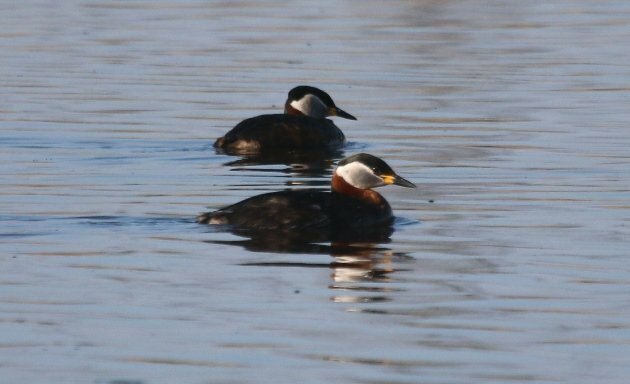 The rarest of the trio, Slavonian or Horned Grebe, only has a very small breeding population with a handful of pairs in Germany’s far North. It is a frequent yet uncommon winter visitor and often lingers long enough to be seen in its speldid breeding plumage, so few birders bother to search for it on the German breeding grounds. I haven’t been there, and it has never caused me restless nights. Black-necked Grebes, on the other hand, are rather widespread throughout Germany much like Great Crested and Little Grebes. 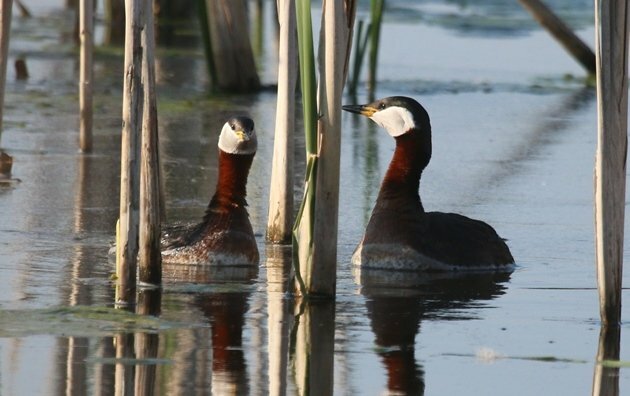 However, their habitat requirements are more specific than those of Great Crested and Little Grebes. As a consequence, they can only be found in certain wetlands where they are often quite numerous, but they are completely absent in surrounding areas. You really want to know the wetlands they hang out at, or else you won’t find them. Additionally, they mostly leave Germany during our winter. Finally, there is the Red-necked Grebe, the star of this post. As breeding birds, Red-necked Grebes are entirely confined to the north-east of Germany. However, they are rather widespread there and not too hard to find as long as you have medium-sized shallow lakes with broad reed beds surrounding them. They do occur throughout Germany during the winter (quite rare) and during migration (still rather rare), and just like the Black-necked Grebe are thus best searched for on their breeding grounds. Also, you really want to see them in their breeding plumage since nobody (except Corey apparently) can easily get excited about seeing this. 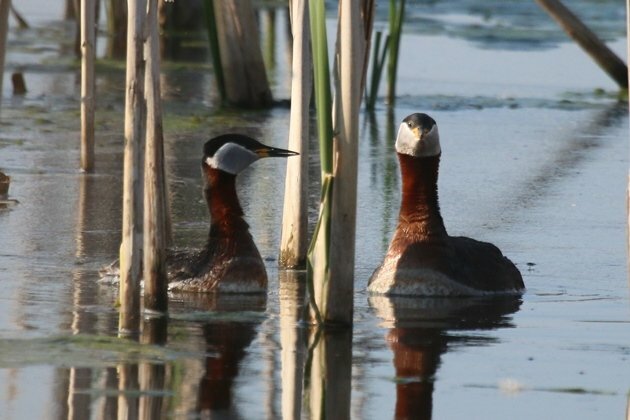 To sum up the situation of grebes in Germany: if those species are your thing- which is what they should be – then summer is your best bet and Germany’s North-east is the place to be. 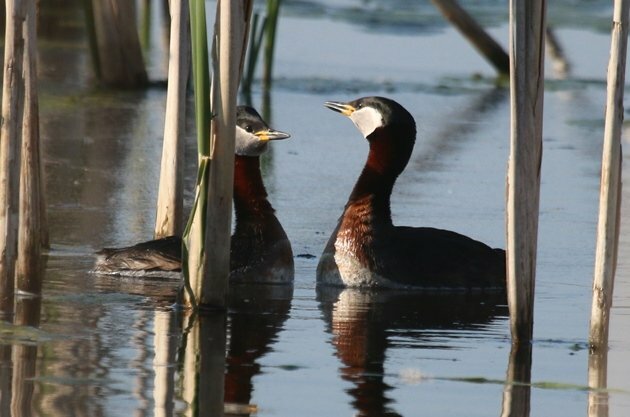 In the state of Mecklenburg-Vorpommern, which is as far north-east as you can go in Germany, encountering four species of grebe (all except Horned/Slavonian) on a single wetland isn’t unusual, and lucky birders will occasionally even find a lingering Horned/Slavonian for a five-grebes day. 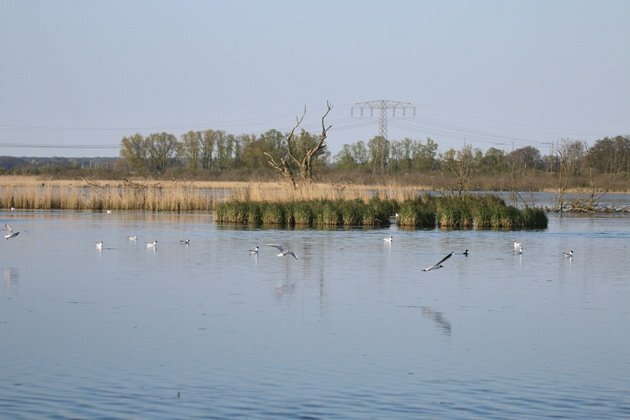 Since the mid-1990s, expansive – like, impressively expansive – wetlands have been restored in Germany’s North-east along the rivers Peene and Trebel, especially from lake Kummerow to the city of Anklam. These shallow wetlands have become not only the best place in Germany for grebes but also some of the nation’s absolutely best birding sites in general. Above is the wetland Grosse Rosin at lake Kummerow, where all the pictures of this post were taken. Now, to the Red-necked Grebe. I honestly have to say that I am not hugely enthusiastic about Red-necked Grebes compared to their cousins – all grebes are really cool and I could probably write a comparable post about any other species provided I have some pictures to share – but my eyes do tend to linger for a bit longer on a Red-necked Grebe during a wetland scan with my scope than on any other grebe that is present. What I really enjoy seeing and what really sets them apart from so many other birds are their cheeks. Yes, the cheeks. Many field guides will have you believe the cheeks are grey. The grey tone even made it into the scientific name of the species, Podiceps (legs at the behind) grisegena (grey cheeks) = Grey-cheeked Buttlegs. However, to my eye that’s not entirely true. Well, the buttlegs part is okay, but the cheeks certainly aren’t just grey. They are silver in the most astounding way, because much like in the iridescent colours of hummingbird, the silvery tone on the cheek changes between deep silvery and almost pure white depending on the angle towards the sun. You know, there certainly are more amazing colours on birds than grey, and I’ve seen my fair share of them, but an (almost) iridescent silvery effect on an otherwise white cheek is pretty unique. And that thin white line that separates the silvery cheeks from the black cap … it’s just the loveliest sight. Another thing I really enjoy are their courtship calls, the eery, scratchy, unearthly voices that come from the reeds and stop you in your tracks. When you are out alone in waders on a vast wetland in the blackness of a moonless night, up to above your knees in water; when you are slightly cold and uncomfortable trying to secure a foothold in the black mud below; when you are trying to hear the faintest bird calls through the silence in hopes of rails; then believe me, an explosion of Red-necked Grebe calls from the darkness of the reeds only a few feet away is just what you need to know you are alive. Jochen Roeder was born in Germany and raised to be a birder. He also spent a number of years abroad, just so he could see more birds. One of his most astounding achievements is the comprehension that Yellow-crowned Night-herons do not exist, as he failed to see any despite birding in North America for more than two years. He currently lives near Heidelberg, one of the most boring places for a birder to live, a fact about which he likes to whinge a lot. When he is not birding or trying to convince his young son that patiently scanning some fields for migrants is more fun than working the jungle gym of a playground, he enjoys contemplating the reasoning behind the common names of birds. He first became famous in the bird blog world on Bell Tower Birding. Where Are You Birding This Second Weekend of September 2018?